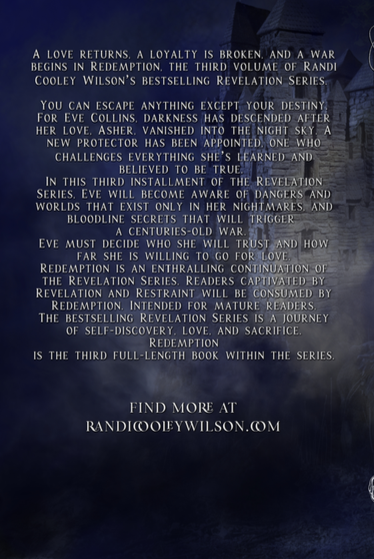 A love returns, a loyalty is broken, and war begins in Redemption, the third volume of Randi Cooley Wilson’s bestselling The Revelation Series. You can escape anything, except your destiny. For Eve Collins, darkness has descended after her love, Asher vanished into the night sky. A new protector has been appointed, one who challenges everything she’s learned and believed to be true. In this third installment of The Revelation Series, Eve will become aware of dangers and worlds that exist only in her nightmares, and bloodline secrets that will trigger a centuries-old war. Eve must decide who she will trust and how far she is willing to go, for love. Redemption is an enthralling continuation of The Revelation Series. A journey of self-discovery, love, and sacrifice. Readers captivated by Revelation and Restraint will be consumed by Redemption. Intended for mature readers. The bestselling Revelation Series is a journey of self-discovery, love, and sacrifice. 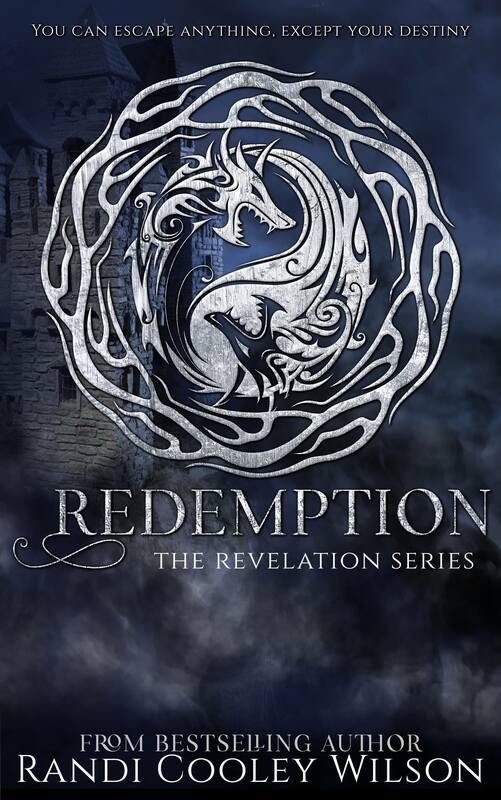 Redemption is the third full-length book within the series, which is meant to be read in release order. Honestly, I didn't even think that it was possible to fall anymore in love with this series or the amazing characters but obviously Ms. Wilson just had to prove me wrong. Redemption was such a fantastic read, and I loved every single second of it! This book was spectacular. I mean that in every aspect of the word. Anyone that enjoys supernatural/romance books will fall in love with this book/series as I have. Randi had me glued and dying to find out more and I have got to say I never saw any of it coming. This book is really great and I don't know how I can describe how much I enjoyed it. A fantastic, hot, witty, smexy Paranormal Romance that will draw you in and not let you go. I can't recommend this highly enough! Just when I was starting to think things were as they should be, and everything was right in the Collins/St Michael world, Randi goes and throws another spanner in the works, leaving me open mouthed … I hope Randi Cooley Wilson is busy writing right now, because I need book 4 STAT!